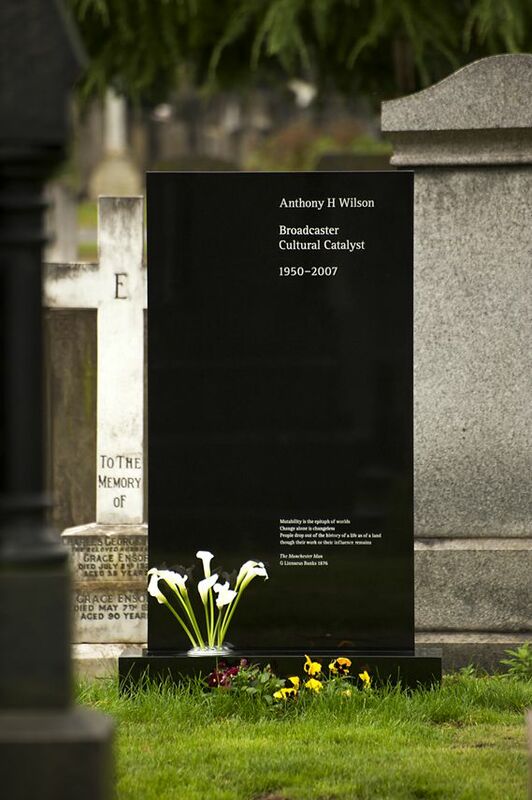 Creative Review – Saville and Kelly’s memorial to Tony Wilson. A new release from Si at Spoilt Victorian Child Records, described as ‘very very loud fuzz-drenched guitars’? Oh, go on then. BB pal Michael W. Dean recently reminded us of the work of K Foundation, the UK anarcho-prankster duo who set about to become ginormous pop stars in the 1980s, and did just that as The KLF. From the outset, they adopted the philosophy espoused by esoteric novels The Illuminatus! Trilogy, gaining notoriety for various anarchic situationist manifestations, including the defacement of billboard adverts, the posting of prominent cryptic advertisements in NME magazine and the mainstream press, and highly distinctive and unusual performances on Top of the Pops. Their most notorious performance was at the February 1992 BRIT Awards, where they fired machine gun blanks into the audience and dumped a dead sheep at the aftershow party. This performance announced The KLF’s departure from the music business, and in May 1992 the duo deleted their entire back catalogue. With profits earned from KLF, Drummond and Cauty created the K Foundation, with a mission to subvert the contemporary art world. 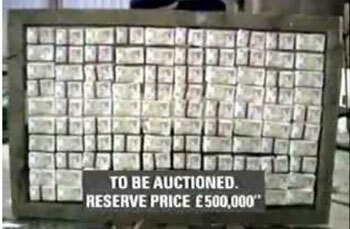 Among the hijinks that ensued: an alternative art award for the worst artist of the year, and burning a million British pounds in cash (about $1.8 million US at the time), which represented nearly all of their pop star earnings. 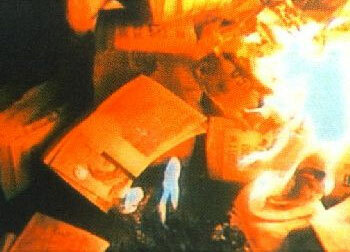 The odd process leading up to that torching, and the burn itself — which took place on a Scottish island in the summer of 1994 — are documented in the film K Foundation Burn a Million Quid. You can watch that on the youtubes, in five parts, starting here: Video Link. Update: Thanks to the many BB readers who pointed out that the whole film is available in a single, less crappy quality, downloadable file on Google Video: Link. We were strolling through Foyles the other day and stumbled across this stunning new Future Classics series from Gollancz, the science-fiction and fantasty arm of Orion Books. The front covers are really startling in their boldness. No title. No author name. No publisher’s logo. Just fantastically striking and truly graphic images, combined with a great use of material and print process. Of the three above, from left to right, Fairyland by Paul J McAuley uses a holographic foil and irridescent cover stock; The Separation by Christopher Priest uses an uncoated stock and a deboss; and Hyperion by Dan Simmons uses a spot varnish over black. The spines and back covers have been given a series style with what looks like American Typewriter as the series typeface. R.I.P. Tony Wilson, founder of Factory Records and the Haçienda nightclub. His effect on British music will live on forever. This video for the song “Grip” by the band zZz, produced by Xelor & Goeroe media, was recorded in one take with professional trampoline gymnasts replicating typical video effects. It’s very clever and with any luck might make them famous as OK Go. Well it’s about time! Engadget has coverage of the Apple & EMI joint event, live from London. In summary, EMI are selling their entire catalogue as a new iTunes Music Store “premium” option: $1.29/€1.29/£0.99 per song gets you a DRM-free, 256kbps AAC track. That’s 30 cents/20 pence extra for no DRM, hence better interoperability, and better audio quality. Apple will still sell “standard” EMI tracks with DRM and 128-bit AAC encoding for $0.99/€0.99/£0.79. “Premium” albums will cost the same price as “standard” albums, which is great news; along with Apple’s new “Complete My Album” feature this will hopefully redress the “death of the album” that’s been happening since single-track purchase came into existence. Record sleeve designs of the week from Creative Review.